I love the soft colors that were used in these layouts by the designers. I usually think of brighter colors when I think of anemones, so it shows how versatile this set is. I just love seeing stamps incorporated into scrapbook pages. Just opens a whole new world! What a beautiful set….this is going on my WISH LIST for sure!!! Wow! What a stunning set! Love how beautiful image is when all the layers are done! OH MY … my favorite stamps are of flowers … this is gorgeous. A beautiful stamp set and lovely layouts. I am not sure if I qualify for giveaways as I am in the UK but would be interested to know please? Gorgeous, stunning stamps and dies, love them. Beautiful stamp,set! This whole series of stamps has been a winner. Beautiful layout! Love the soft colors and the stamped flowers look so wonderful on this page. We’re certainly getting tons of inspiration for the new anemone flowers. I loved the scrapbook layouts that were done and especially the colors used. Beautiful! Anemone stamp set is soooo beautiful! I love it. And layout is awesome!! Love your products…they seem to take scrapbooking to another level!! What a BEAUTIFUL flower, you have such a talented design team I really look forward to see what they make not only on the 15th of each month but everyday. Thank you. Love the pages and the use of the layering stamps, love anenomes. Love how the flowers were used on the beautiful layouts! I love layered flowers. I am not good at drawing or water coloring, but the layered stamps make me look like an expert. They do all of the work for me. Thank you! And the layouts are spectacular! Very classy. love the layouts created with these beautiful stamps, especially love that Lilleth has used this floral stamp on a “boy” layout. 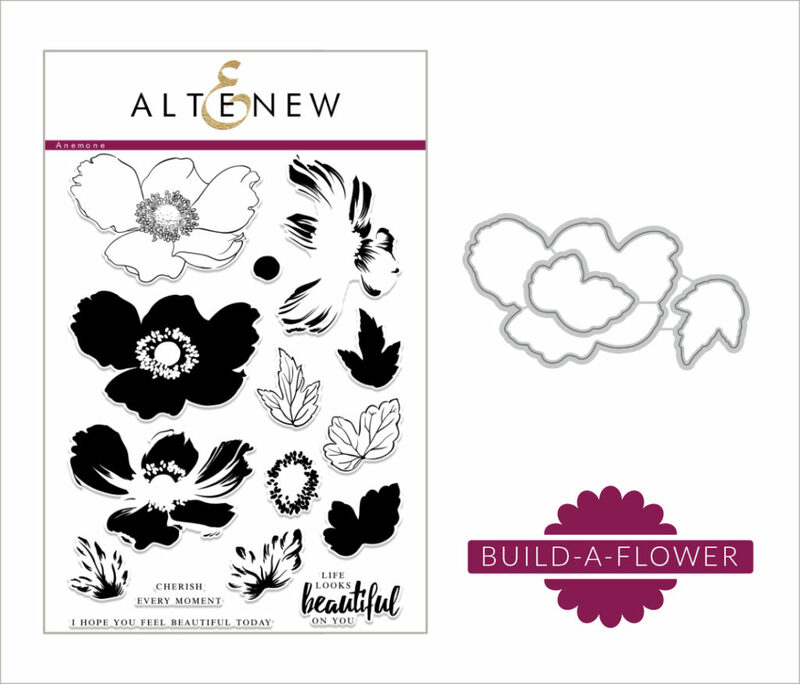 This is a great set and lives up to the reputation that Altenew must be receiving. I LOVE the Altenew stamps and dies. This is a really lovely set. I almost never stamp on a scrapbook page but these examples are really lovely and an inspiration to try! Thanks! What a beautiful page! Love the stamp set you used to create it. I don’t scrapbook, but these ideas could be converted to be used for a card, thanks for a chance to win. Another gorgeous floral set! Beautiful pages! DELIGHTFUL layouts to EXCITE and INSPIRE! Wowwww love you anemona is great!